The spring 2009 issue of ISR's Systems Solutions newsletter is now available in PDF format. 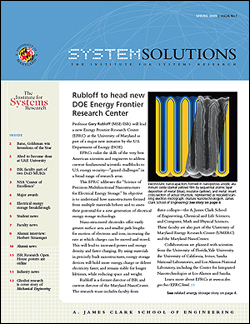 It contains stories on the new DOE Energy Frontier Reseaerch Center, the Invention of the Year awards, the new NSA "Center of Excellence,"two new Department of Defense MURI awards, ISR Director Eyad Abed's move to UAE University, and more. Visit our newsletter page to download this issue!